CB23 includes the most common sizes of mini-Centronics style connectors (also known as CHAMP FH) used in SCSI II and III, parallel printer ports (36-pin), and other applications requiring high density impedance-controlled connections. 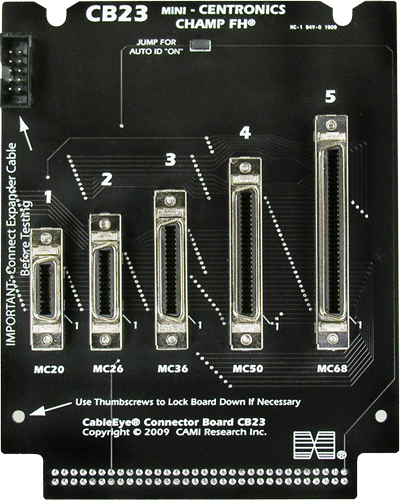 Board includes female connectors with 20, 26, 36, 50, and 68 pins. Requires 152 test points; compatible with Model M2 (Items 811, 811U) or M3 (Items 821, 821U). Bare board available for other connectors that fit the 4-row PCB footprint of these connectors; contact us for details and pricing for the bare board version. Set of two boards with expander cable.